Neanderthals had large, protruding noses to warm and humidify cold, dry air, a study into the distinct design of our extinct European cousin's face suggested Wednesday. 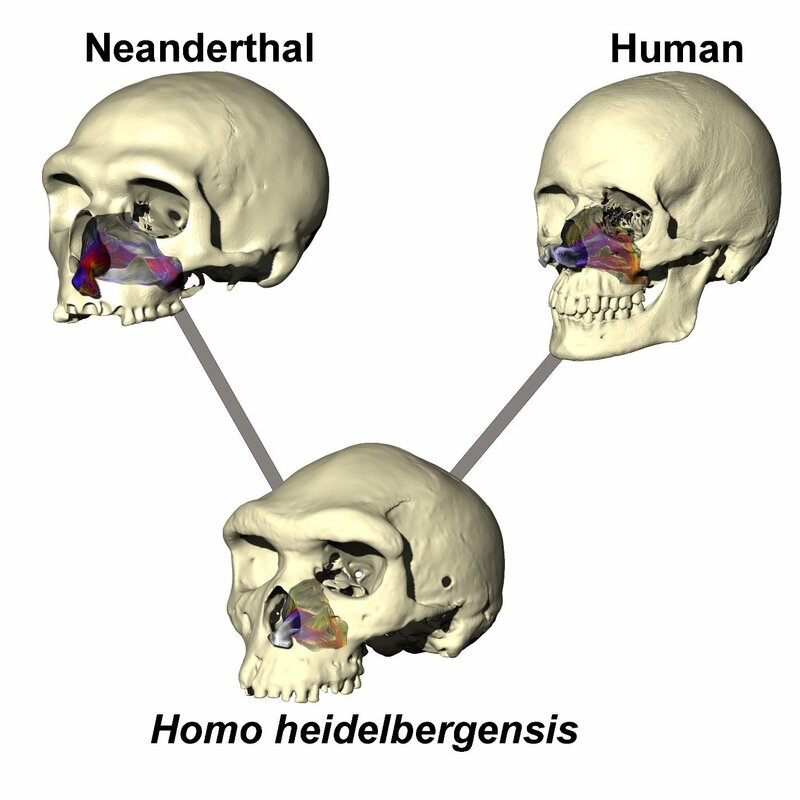 Using 3-D models of the skulls of Neanderthals, modern humans, and Homo heidelbergensis—considered to have been the common ancestor of both—an international research team found very different breathing adaptations. 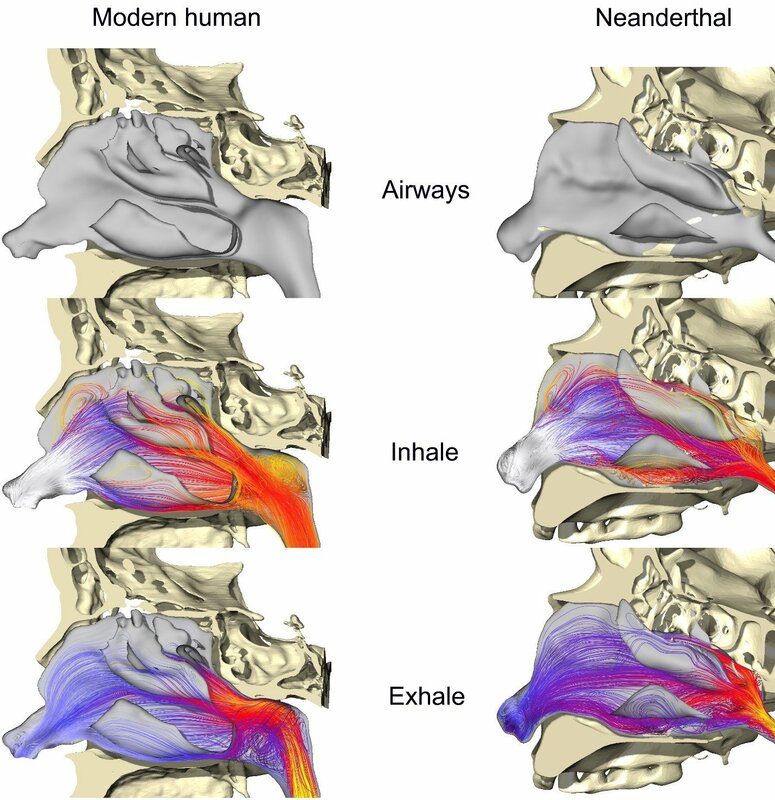 Computerised "fluid dynamics" revealed that the shape of Neanderthal and human faces "condition air more efficiently" than H. heidelbergensis, suggesting that "both evolved to better withstand cold and/or dry climates," the researchers wrote in the journal Proceedings of the Royal Society B.
Neanderthals could also move "considerably more" air through their nasal cavity than could H. heidelbergensis or modern humans—possibly in response to higher energy requirements for their stocky bodies and hunting lifestyle. Neanderthals were thought to have required as much as 4,480 calories per day to keep them alive in the European winter. For a modern human male, 2,500 daily calories are recommended. A high-calorie intake requires more oxygen to burn the sugars, fats and proteins in our cells to produce energy. Scientists have long debated over the reason for the Neanderthal's face shape, which includes a large, wide nose and protruding upper jaw. One theory was they were built to exert more bite force. But Wednesday's study said this was not the case. 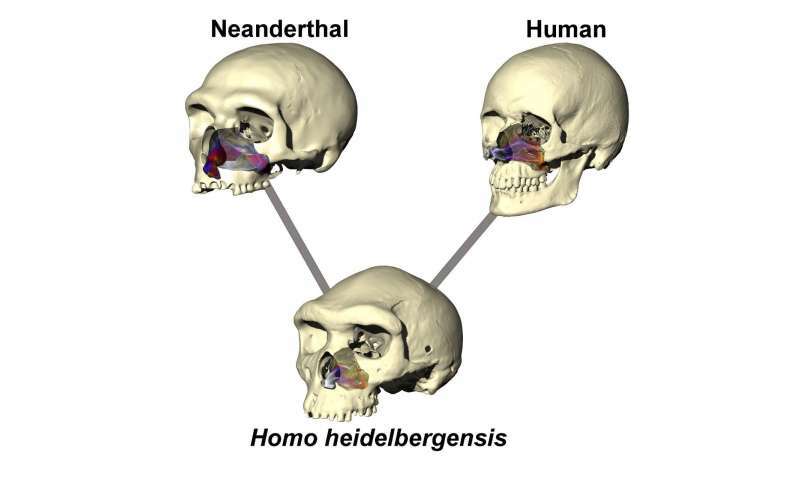 Computer simulations showed that Neanderthals "were not particularly strong biters" compared to humans. 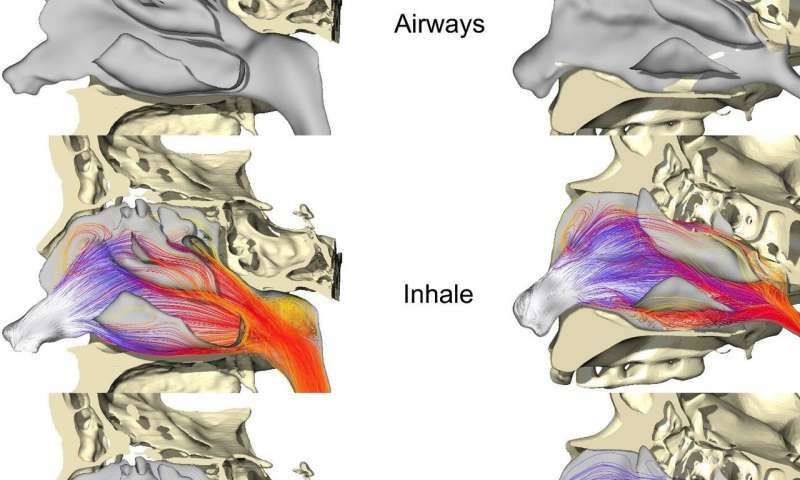 But "where the Neanderthal really excelled is in its ability to move large volumes of air through its nasal passage, indicating a very high-energy lifestyle." 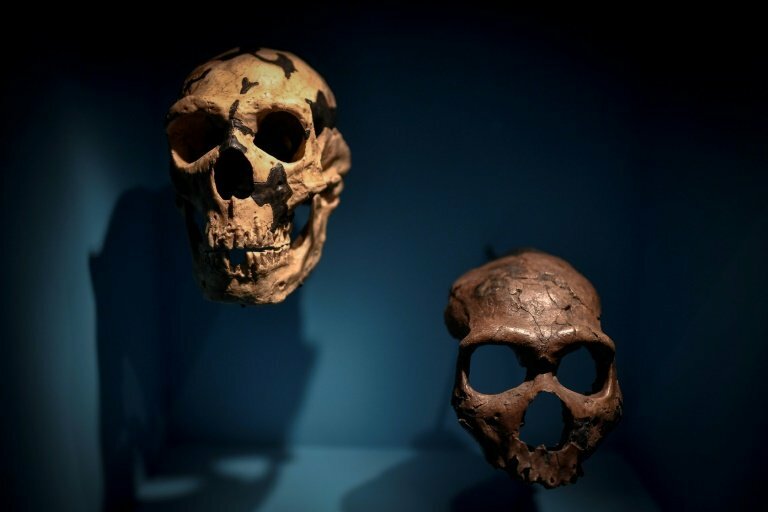 The conclusion, said the team, was "that the distinctive facial morphology of Neanderthals has been driven, at least in part, by adaptation to cold"—both to "condition" cold, dry air, and to absorb more oxygen. 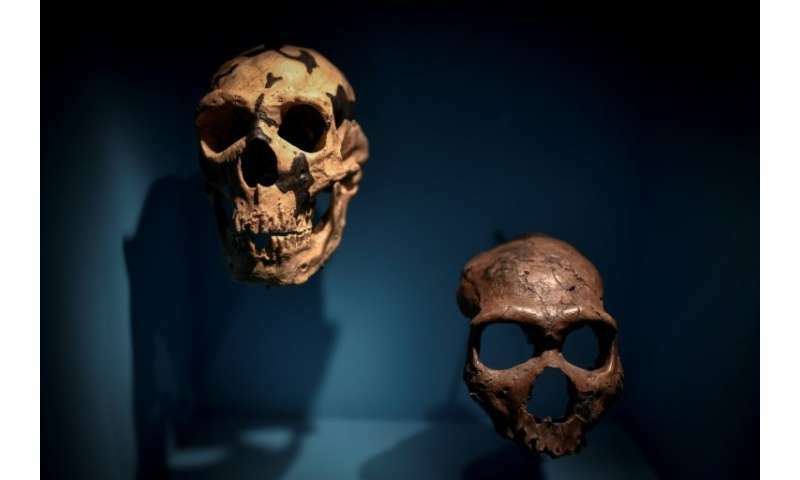 Neanderthals emerged in Europe, Central Asia and the Middle East some 200,000 years ago. They vanished about 30,000 years ago—coinciding with the arrival of modern humans out of Africa. The two groups briefly overlapped and interbred, and today, non-African people are said to carry about 1.5-2.1 percent of Neanderthal DNA.